Today, something easy : lets use a SD Card Reader with our arduino. Can be useful for instance when you want to log datas such as temperatures or any other sensor. I use this component from DS : SD Card Slot Socket Reader. First the wiring : standard SPI (SCK/MOSI/MISO/CS). That was it : quick and easy ! 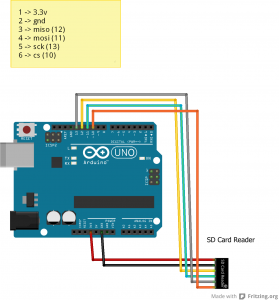 Haha, I didn’t even know that Arduino has its own library for SD cards!